About Us – Atlantic Overhead Door And Dock Inc.
Jim Mansfield started Atlantic Overhead Door & Dock in 2000 as a way to provide above and beyond service to potential customers. After serving thousands of customers in his over 25 years of experience with garage doors & loading dock equipment, he knew he could do it better. Atlantic Overhead Door has operated in Paradise, NL since 2000 servicing the entire province of Newfoundland & Labrador. Since starting in 2000, Atlantic Overhead Door & Dock has provided Newfoundland & Labrador with the highest quality work in the province through safe, efficient and timely service. We have been awarded the Consumer Choice Award in Garage & Overhead Doors for 2015, 2016 & 2017/18. Striving to provide the best quality and customer service is something that we pride ourselves on and we always leave a job with the customer happy. 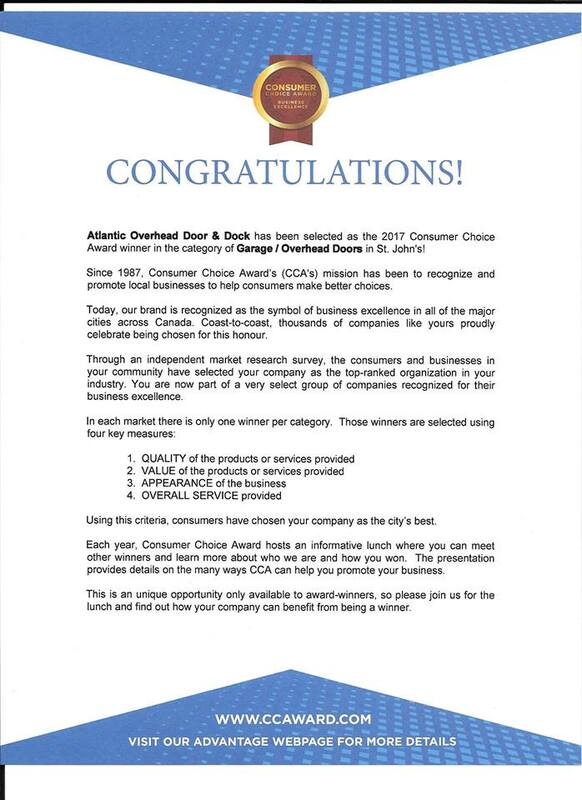 Atlantic Overhead Door & Dock wouldn't be where we are today without our team! Each person has a defined role that allows us to improve and grow while still providing the best quality and service in Newfoundland & Labrador! Jim has 25 years experience in residential and commercial door and dock installation and service. Brian not only brings his wealth of knowledge in installations and service but also his great sense of humour, you'll find it a pleasure having him servicing your needs weather it be at your place of business or at your home. Sharon will always greet you with a friendly voice when you call or a smile when you come to our office. She is always ready to look after your needs and answer any questions you may have about our products and service. Are you looking to have a new garage door installed or serviced? Contact us now for a quote!